Mary Ann Thompson is a native of Southern Maryland and was raised in Leonardtown, MD. In 1984, her career began at the Federal Bureau of Investigations, Washington Field Office Division. After five (5) years of commuting from Southern Maryland, in November of 1989 she joined the Corrections Division of the St. Mary’s County Sheriff’s Office. 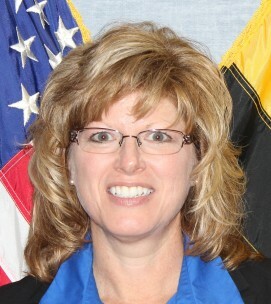 With 26 years of corrections experience, she now serves as the St. Mary’s County Detention Center Support Services Manager providing professional guidance and direction in planning, leadership and management of a 230 bed detention facility ensuring the custody, security and welfare of inmates. As a member of the executive management team she recommends, develops and executes the goals and objectives necessary to provide services and lawfully detain inmates as required by the Laws of the Federal Government, State of Maryland and Local County Government. Key career proficiencies include: Strategic Planning, Financial Management and Oversight; Operational Budgeting; Project Management; expansion/Renovation of a Correctional Facility; Staffing Analysis; Facilities Maintenance; Leadership/Management; Procurement/Contracts; Custodian of Records; Audit Manager and Policy Development. Mary Ann serves on the Maryland Commission on Correctional Standards as a Duly Authorized Inspector; Maryland Correctional Administrators Association as Treasurer; Middle Atlantic States Correctional Association on the Board of Directors and is a Member of the American Jail Association.